This gorgeous bouquet is perfect for any wedding decor or bridal shower! Cut out 3 layers of petals (4 petals per layer) per flower, using both the cream and white cardstock sheets. Using a black cardstock sheet, punch out a 1” circle for the center of each flower. Using the electronic cutting machine, cut out a 1-1/4” scalloped circle and a 1-1/2” sunburst (both out of black cardstock) for the center of each flower as well. 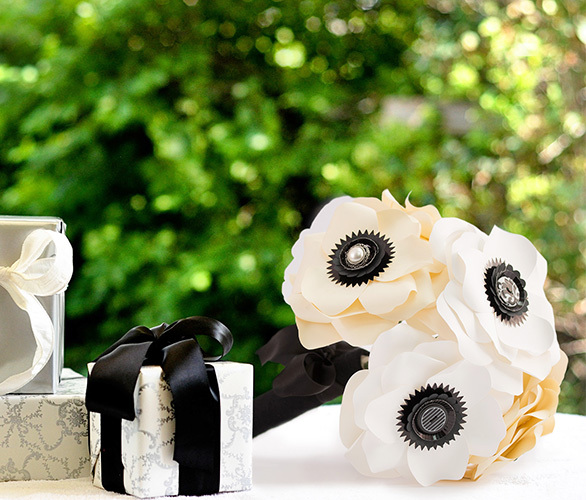 Assemble each flower together, alternating petals between layers, to create desired amount to finish a bouquet. Adhere the sunburst and scalloped flowers (largest one on the bottom) in the center of each flower. Fringe cut the ends of each 1” circle, and then adhere one in the center of each flower. Finish off each flower by adding a button in the center. Using a piece of wire, create a small circle shape at the top (approximately 3/8” to 1/2") and then push it flat (perpendicular to the rest of the wire). Repeat to create as many wire pieces as there are flowers. Attach a flower to the top of each circle. Adhere a button in the center of each flower. Holding all the flower “stems” together, wrap with a section of ribbon from top to bottom and back up again, tying it off in a bow just below the flowers. Don’t have access to a personal electronic cutting machine? Find a flower petal pattern on the Internet, using that as a template for each flower. Paper punches can be used to create the scalloped and sunburst center pieces instead of die cut shapes on a personal electronic cutting machine.